If you haven’t taken the time to put your decorations together it’s time to get a move on. With Halloween just around the corner big elaborate displays are pretty much out of the question, but [Boris] and the team over at Open Electronics have a simple project that’s sure to be a hit with the Trick or Treaters. Using a cheap plastic prop that you can likely find at any Halloween store, they have put together a simple talking skull that moves along with whatever music or sound is being piped through it. 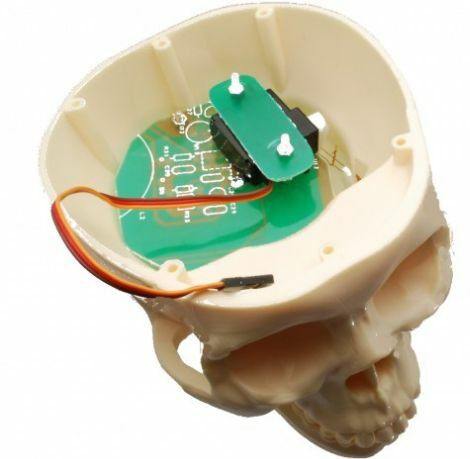 The skull’s mouth is moved by a single servo mounted inside the brain cavity, which is controlled by an Arduino. The Arduino monitors the sound level of the source audio being played, actuating the servo accordingly. It’s quick, simple, and effective – perfect for a last minute decorating project. If you are a little more ambitious, you could always put together a whole chorus of skulls without too much additional effort – just a few extra skulls and some servos would do the trick nicely. Check out a quick video of the skull in action below, along with another short clip showing how the servo is rigged up to move its mouth. buuut… if you use a bandpass filter, before feeding the audio to the uC, then you can get the jaw to move to loud VOICE (mid range freq.s) instead of loud voice(mid) AND bass AND treble. its easy to add, just two resistors and two capacitors, google/youtube “DIY color organ disco light” -> you only want the mid-range filter.